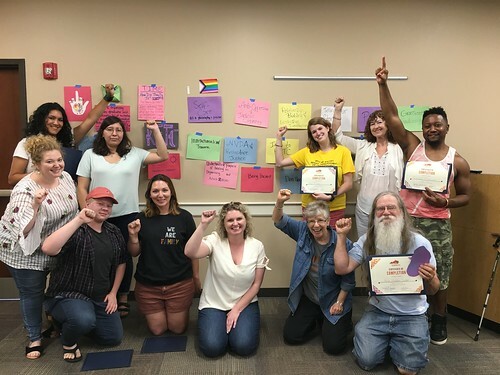 Applications are now LIVE for the 2019 KFTC Organizing Academy Cohort. Apply here! Do you want to build your own community organizing skills and confidence? Learn about how to have effective conversations with folks in your community? Better understand how to develop an organizing strategy that will win issues and benefit Kentuckians? If so, then apply for KFTC’s 2019 Organizing Academy today! The deadline to apply is January 14, 2019. The 2019 Organizing Academy will include a cohort of about 20 participants who will engage in a three-month training program from March 2019 to May 2019 called "Organizing 101: Building Power Through Organizing” where they’ll learn organizing skills while helping make tangible, positive change in Kentucky. Members of the Organizing Academy cohort will be expected to attend in-person trainings from 10:30 a.m. to 4:30 p.m. EST in the central Kentucky area on the six Saturdays listed below. The cohort will also ask that participants read, listen, watch and engage with various resources throughout their three-month training, as well as participate in discussions and reflections with your fellow cohort members on a monthly video call and in an online platform. Cohort members will also be asked to lead organizing projects in their region to use the tools and skills they are learning in order to build grassroots power across the state. Skills and tools for self-care, healing, and communications will be interwoven throughout the curriculum. As members of the cohort, participants will be asked to help KFTC evaluate the Organizing Academy cohort program and shape future programs. Therefore we are looking for people who believe in organizing as a primary strategy, are committed to the future of KFTC and look to apply the skills learned in their community, KFTC chapter or other grassroots organization. Also, note this is a general introduction to community organizing training cohort. Other advanced trainings will be offered throughout the year, but this program is a great baseline foundational program. If you have questions or would like more information, please contact Beth Howard at bethhoward@kftc.org or at 386-299-2921.